I got married at The Angel Orensanz Foundation, an event space on the Lower East Side of Manhattan that at one point had been a synagogue. The ketubah signing was at the basement level, the ceremony and reception on ground level, and cocktails on the upper balcony. There are no elevators at the venue, so the only way to get from one level to another is via the stairwell. Needless to say, it’s a tricky venue to navigate – particularly if you are the caterer and your waiters have to carry food and drinks from the basement level to the balcony, which is two flights up. We were about to sign a contract with a caterer we really liked, when all of this had been brought to our attention. The caterer had never worked at this venue before, so we would be his “learning experience” and there was potential for disaster. At the last moment we hired another caterer who had worked weddings at the venue on numerous occasions, and all worked out well. My advice is to stick with vendors who are familiar with your venue. Our photographer took the most amazing photographs. So many friends have commented that they are the best wedding photos they’ve ever seen. We absolutely loved them, but were disappointed with one thing: many of our closest friends and relatives were omitted from the photos. Photographers tend to be drawn to the most photogenic people. It’s only natural. In our case, we ended up with more photos of our neighbor who was sporting a mohawk, than our own immediate family and best friends. 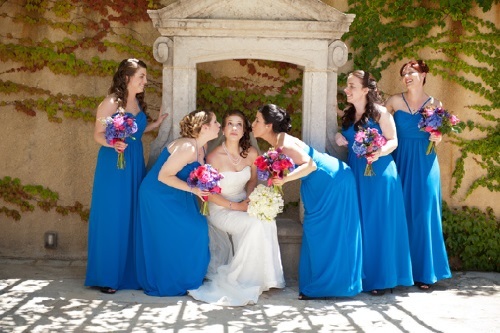 It is always important to convey to the photographer who the most important people are at your wedding both prior to the wedding, and on your wedding day. Photographers who offer packages will most likely put together a shot list, but photojournalist style photographers like ours may not. If you want a shot of you and your childhood best friend, be sure to pull the photographer over to take one of you, or that photo may be missing from your album like it was from mine! Prior to my engagement, I never knew what a day planner was. Once I found out, it seemed to me like a needless expense and a great waste of money. Boy, was I wrong. A planner is much like the ringleader at a circus. He makes sure that the lions and tigers and bears come out on cue and that the circus starts and ends on time. Many venues provide a point person like this for you. Our venue did not. We mistakenly thought that we would be able to coordinate our own rehearsal, and keep the timeline of our wedding going. The result was that we ended up working really hard on our wedding day – we rounded everyone up for the rehearsal (it’s much harder than it sounds!) told the DJ when to stop playing the dance music and start playing the dinner music, and instructed the caterer when we should cut the cake. We should have just been able to sit back and enjoy the experience, and you should too. My advice – splurge on a day planner! Newlyweds – do you have advice to share? Please post your advice in the comments section! Wedding stationery can be obtained from a number of sources: mail order, printer, stationers and stationery designers or you can buy online from confetti.co.uk’s extensive range of wedding stationery. Invitations – envelope seals – cake boxes – place cards–matchbooks – serviettes – serviette rings – coasters – favour boxes – menu scrolls – menus – guest book – adhesive bottle labels – seed sticks – personalised ribbon – acceptance – order of service sheets – thank you cards – you can even have chocolates with personalised wrappers! It should also be said that many of these items provide delightful keepsakes and at least some are worth considering. They can also provide a wonderful way of continuing a theme for your wedding. Invitations are obtainable in virtually any design you choose and specialist companies can even offer you the option of having your invitation personalised. Don’t forget that you will need separate invitations for those being invited to the evening reception only and there is also the option of including response cards together with printed envelopes. Personalised stationery can set the tone of your wedding and can co-ordinate with your table theme and colour. All Confetti personalised stationery is made from the finest quality materials. You can find a range of quality boards, ribbons, foil printed and embossed designs. You can choose from over 85 colours and designs, 8 typefaces, a wide range of colours and links, luxury insert envelopes, boards, materials and designs. A large variety of stationery ideas are found on the Confetti website and catalogue. You can create your own unique stationery at amazing prices. This enables you to print your own stationery at home and add unique details to your stationery. You can create your own from invitations to menu cards with a variety of creative outers and inserts that can be printed and trimmed at home. 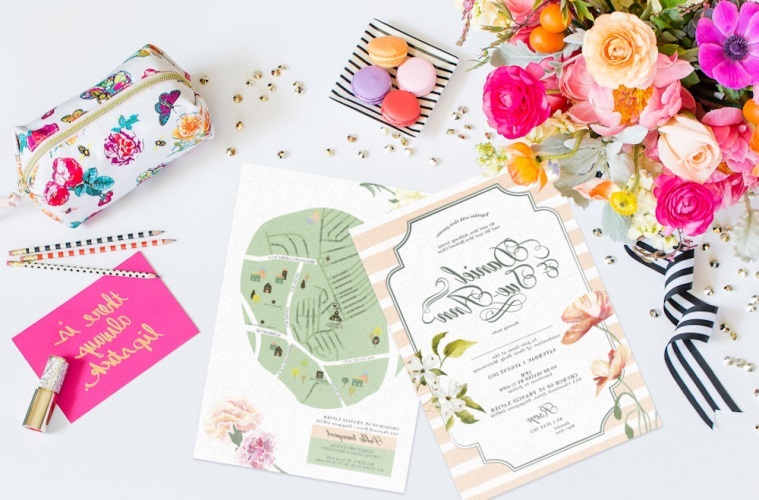 There is also a wide range of imprintables, and decorative trims where you can either print or handwrite your own invitations, and add decorative details on them. You can use the print centre on the confetti website to download free Word templates, enabling you to get a professional look at a lower cost. A large variety of additional stationery ideas are found on the Confetti website and catalogue. Custom designed stationery is becoming more popular and really add something to the image of the occasion. Commissioning a designer to create your wedding stationery is one way of putting a personal mark on your wedding but remember that it will almost certainly take longer to deliver than pre-printed items. Taking into account that invitations should be sent out no later than six weeks before the wedding and preferably eight to nine weeks before, a first consultation with the designer should really take place around four or five months before the wedding. Prices will naturally be higher than for mass produced stationery but by how much will depend on the amount of work involved, the quality of the paper used and the number of items ordered. It is important to fix a deadline for completion and the price at the beginning in order to avoid unpleasant surprises. Save the Date: Send these to your guests in advance of your wedding to make sure they keep your special day free. Invitation: Send these to your guests about 6 to 8 weeks prior to your wedding to make sure they respnd on time so you can plan accordingly. Evening invitation: Send these to the guests not attending the ceremony, to invite them to the wedding reception. Order of service: Give these to your guests at the ceremony to follow the hymns and reading of the ceremony. Acceptance: Give these to your guests to respond to the invitation of your wedding. Thank you: Send these to your guests to thank them for your wedding gifts. Place cards: Place these on the tables at your reception to help guests know where they will be sitting. Having a hard time choosing your stationery ? It’s easy when you’ve got all the options in front of you, simply order the samples! Each range can be completed with thank you cards, place names and order of service sheets.